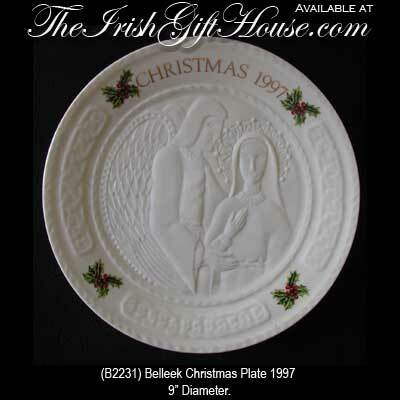 The 1997 Belleek Christmas plate is retired and limited to stock on hand. This Belleek Christmas plate features an embossed design of Mary with an angel along with Celtic knot-work. The fine china Irish plate measures 9" diameter and it is handmade in Belleek, Ireland. The 1997 Belleek Christmas plate is gift boxed with a Celtic knot history card, complements of The Irish Gift House.